﻿For girls who love piggy, all piggy items would become their collection. I know this as I'm one of them. 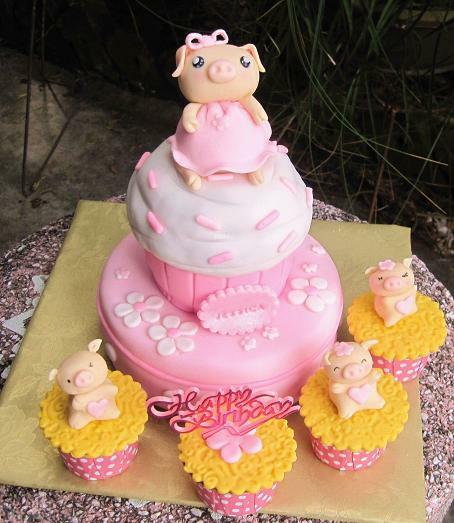 When Sally asked me to do a piggy cake for her youngest daughter's 19th birthday, a piggy lover like me, I was really excited. She expected a special design which I had never done for her before. Frankly say, I was a bit tensed up, I needed to think out of the box. The theme colour was again, pink. Hahah, it seems that both her daughters love pink. I did one birthday cake for her elder daughter earlier in pink too. So, ok, pink, piggy, how about the rest of the design? 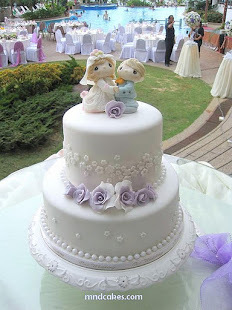 Don't let the cake to look like a cake? The scope is getting too wide for me then. Ok, well, just let it looks like a cake! These are the dad, mom and sis piggies, happily dancing together to celebrate Jessica's birthday! 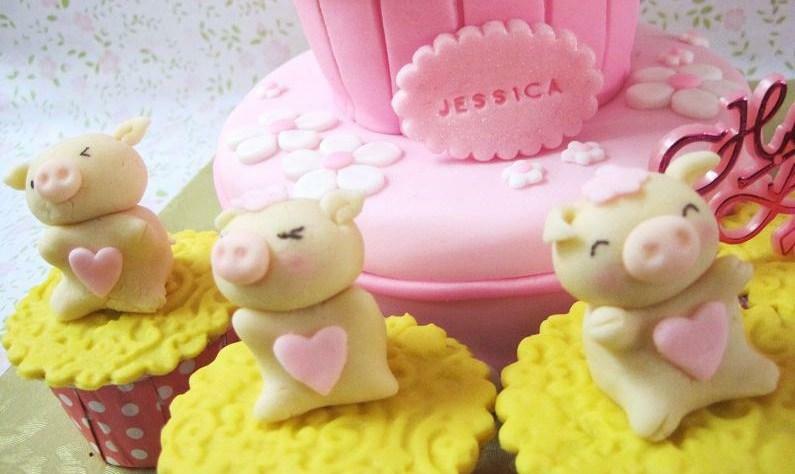 Happy birthday to you, dear Jessica! Glad that you like the cake. I realy realy LOVE it!! It Look so cute! especially the adorable eyes of piggie! One of the best cakes ever! And it taste great too!! Oh! You must be Jessica, hehe! How sweet your comment is, it means a lot to mom and I! Thank you! Wish you a very sweet 19th and happiness throughout the year! What did u make the piggy out of? Fondant? 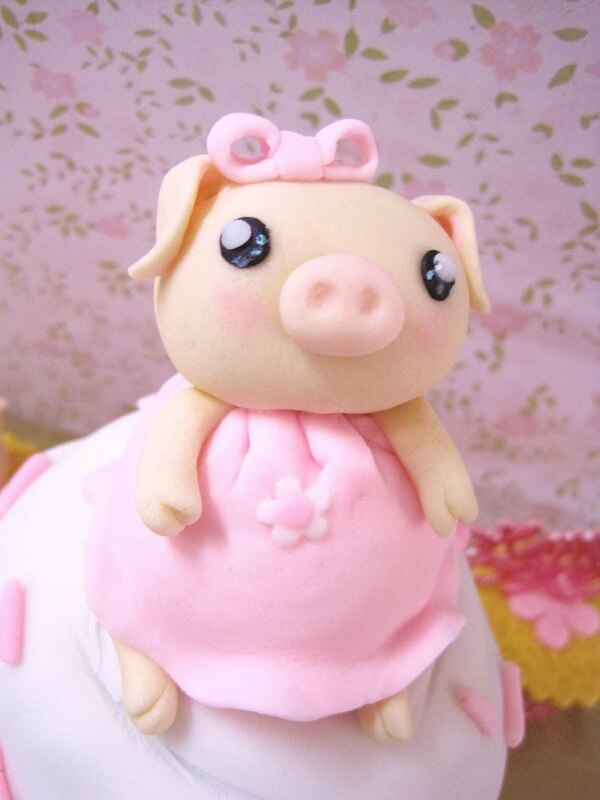 I'm not a baker just a fellow piggy lover. I would hope u kept the piggies who were all so adorable I wouldn't have let anyone eat them. I would have removed them & let them dry & just have eaten the cake. 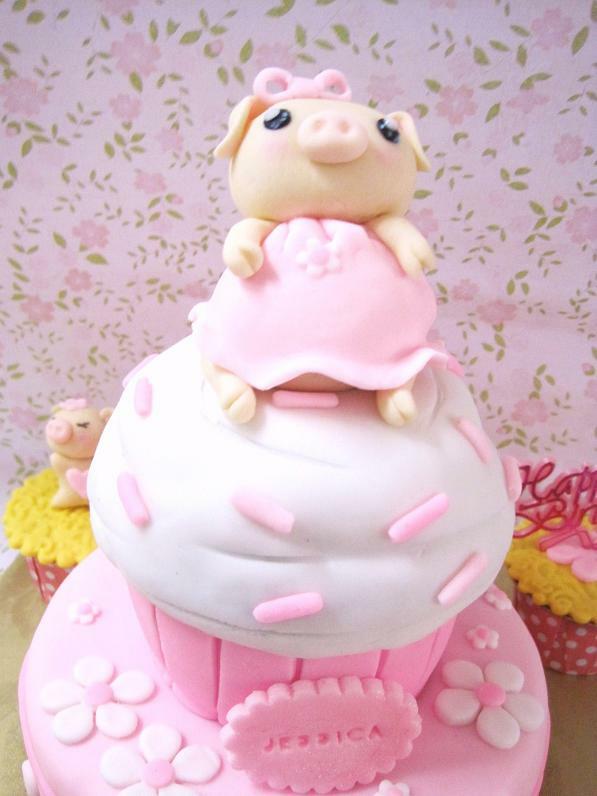 Piggies & cupcakes are both my favorite collectibles. My kitchen decor is a mix of both. But my favorite piggy is my very own adorable Bella Blue who is a teacup pig. My 10 year old daughter sent me a pic of this adorable cake. I wish I could have one of these cakes but doubt u live n my area. Your work reminds me of figures made of sculpey clay. Adorable!